Its been awhile. Its been a rough 2014 but with bright spots from work and friends and family; especially S and W. Those two man! I want to say that I feel so lucky to be happy. Life happens but through everything I am so lucky to have what I have and am so content. How many people can say that?!!? I hope a lot and add me to the list! Anyhoo! I accomplished my 2014 resolutions. I went to the dentist and went BACK to the dentist to get cavities filled. I love them–the office is totally feminine (W recommend me; Ha!) and looks like a dentist office on a tv show–all frosted glass and white and super stylish. I go back for a cleaning in January and am actually EXCITED about it. I also had an art show! Yay! SO! In that vein here are my 2015 resolutions! 1. go to a dermatologist and get the weird patch of dry skin on my shoulder looked at. I think it’s just a cyst and I have had it forever but its time. 2. 2 art shows! I had 1 last year so I figure I should double it. I have one already scheduled for February! Now that Susie is a little older I want to push this. 3. Get my CCRN! Go Nursing! I love my job and my coworkers! Its hard and stressful sometimes and can be physically exhausting but I love it and, for me, way better than being bored. I operate best stressed and exhausted and helping people! 4. Work my way down to one caffeinated beverage a day. SIDENOTE: I am working on eating healthy, losing weight, working out but not something I am comfortable making a new years resolution. Its more of an ALL THE TIME resolution. My Nephew J–adding count to the already Nephew M and Niece L. Visiting home was much needed, perfectly rainy, and too short. Glad to be home though and snuggling with H and getting a brief high-five (if you know what I mean–GROSS TMI!) with W before he jetted off to Toronto. Though with all the babies and engagements going on around Facebook–you know everyone is doing a lot of high-fiving. Hope your Holidays are fabulous! Last week I started at Macy’s–at midnight on black friday in women’s shoes. Yes, it was insane. Yes, I missed out on being insanely merry [tipsy] on Thanks Giving but I also had to take my grandparents home so it wasn’t a big deal. Yes, I sat in Starbucks at 5am wondering how I was going to get through my last 4 hours of a 10 hour shift. No, I did not cry but I was close. Allinall I really like and am extremely excited to work at Macy’s during the holidays. You see Macy’s is big on Christmas and I love it. Most adults get a wee bit cranky and frustrated but I love the lights, the music (especially this), the people, the cookies, the variety of traditions. It makes me smile. In fact the more grouchy others get, the larger my smile becomes. I frikin’ love it. There is a video below that explains why I have an extra soft spot for Macy’s downtown. It features in my most prominent positive holiday experience. Macy’s used to be Meier and Frank and it used to have the best kid holiday land ever with no parents allowed. Kids, and parents, would come from all over the Northwest every year for this Santa Land. 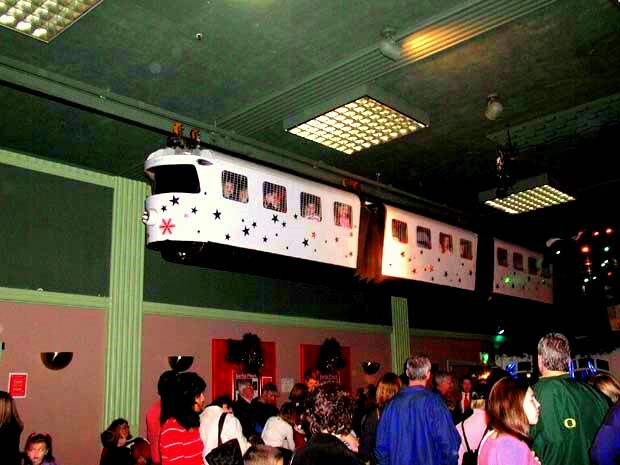 You would climb up the stairs and board a tiny monorail WITHOUT your parents and off you go! You would tour the outer room–usually while punching and kicking your brother with newfound freedom–and wave at your parents below. Then you entered a secret tunnel. This tunnel [hole in the wall] led to a Santa land that was so amazing and unimaginable that I lost memory of it was an adult. I get a feeling of snowflakes and glitter and miniatures below when I think of it. Its like that Christmas book about the kid who goes to Santa land on a train and gets a bell from a reindeer but then as he grows up he can’t hear it anymore. All I know is every kid would stop kicking their sibling, become silent, and just stare down in amazement. It was magic and a place parents would never see. It was so very special. Both my brother and I got to go into Santa Land; as did my niece and nephew. It will be a hard search for something just a great for my someday-kids. Below is a video of the monorail going through the outside area above the parents. It was the last trip in 2005 before Meier and Frank remodeled and became Macy’s. I guess letting a bunch of kids loose on a monorail isn’t safe so they shut it down.